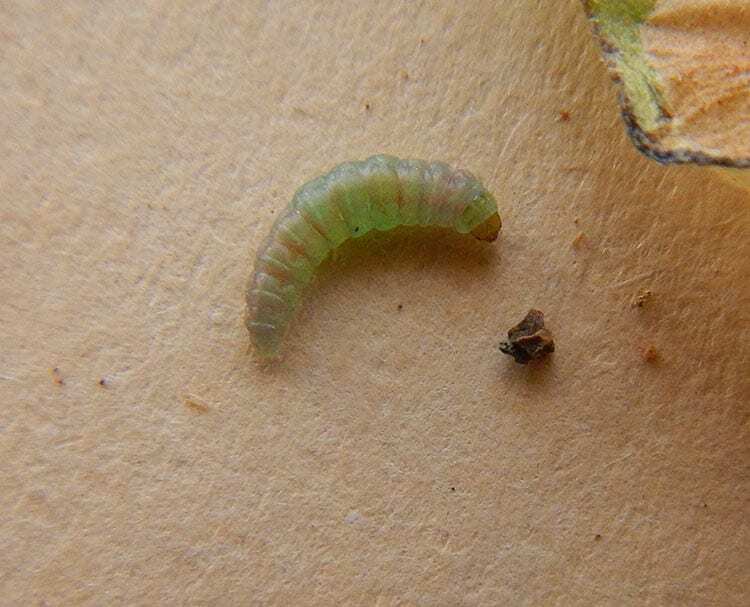 Young larvae are 1mm long and creamy yellow, after time they become greenish in colour and up to 7mm in length. The adult Tuta absoluta is a grey-brown moth, males are slightly darker than females. The moth is only 6mm. Tuta absoluta has a rapid reproduction cycle. Depending on temperature it has a life cycle ranging from 24-38 days. The minimum temperature for activity is 9 degrees Celsius. The larval stage, caterpillar, does not enter diapause as long as food is available. 250-260 eggs can be deposited from one female in her life. These eggs are deposited on plant parts above ground. Eggs develop into a caterpillar, mining inside the leaf, stem or fruit but exit to pupate. Caterpillars prefer leaves and stems, but may also occur underneath the crown of the fruit and even inside the fruit itself. The caterpillars attack only green fruit. The most distinctive symptoms are the blotch-shaped mines in the leaves. Inside these mines both the caterpillars and their dark frass can be found. Leaves die off completely in the care of a serious infection. Malformation is caused bu mining damage to the plant. Damage to the fruit allows fungal disease. Originally from South America, Tuta Absoluta has been a serious threat to tomato crops over a large area for several decades.